The BCW Display Slab with Foam Insert are intended for premium long-term archival storage of your coins, stamps, or other collectible item. 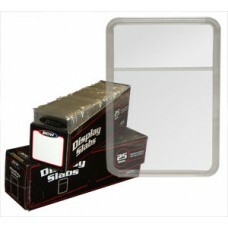 25 pieces per display box; you get 1 box with this deal. (foam inserts packaged separately in bundles of 25 are included). NOTE:The product image for this item is a representation. The hole in the foam insert in the picture may not represent the size you are ordering. Please check the item title to make sure you're ordering the correct size for your needs. Do you have any questions about Box 25 BCW Graded Coin Slabs W/White Inserts Ike / Morgan Dollar?